We all encounter problems throughout the day. Some problems are more significant than others. Such problems can leave us feeling angry or frustrated. As a child, problems can cause reactions much more significant than what the problem actually is. Teaching our children to regulate their emotions will help the child solve their problems more effectively. If your child is having a hard time problem solving, this may be because your child may not be able to regulate their emotions in order to cope with stressors effectively. It can be helpful for kids to utilize an equation to help solve a problem. A problem-solving equation can provide appropriate steps to process stressors. According to Social thinking; One equation or formula to help a child understand a problem is; problem= an unexpected event or perspective + an uncomfortable feeling. It should be noted that not every unexpected event is a problem. Hitting all green lights on a busy street. These situations do not become problems because of the positive emotions associated with them. This is why we add an “uncomfortable feeling” into the formula/equation. Not every problem is created equally. For children, a stressor can be as simple as getting a paper cut or as complex as a family member passing away. In order to help a child with problem-solving, the first step that needs to be done is identifying the severity of the problem. Once they have figured out the size of the problem, the child can match their emotional reaction accordingly. The thermometer diagram from Social Thinking is a great visual example to help a child identify the size of the problem and the proportionate reaction. The numbers 1-4 represent small problems. Small problems are defined as those that can be pretty easily solved on our own, despite feeling slightly sad, annoyed, or worried. Medium problems fall into the 5-7 range. These problems may require assistance, often an adult, to solve. That said, it is expected that kids help solve medium problems. The numbers 8-10 represent big problems. A big problem makes us feel acutely scared, hurt, worried, or upset. Due to the severity of this range, adults should be heavily involved in the problem-solving process. A great way to help a child understand the size of their problem is to illustrate problems on the thermometer on either the green orange or red section or circling the corresponding number in the area. Assist the child in identifying a proportionate response to cope with the problem. Once a child starts to understand the severity of problems, they will be more prone to regulate emotions appropriately, utilize logic under duress and effectively problem solve. This entry was posted on Tuesday, February 12th, 2019 at 5:15 pm and is filed under Special Education Tips and tagged as Special Education Resources, Success. You can follow any responses to this entry through the RSS 2.0 feed. 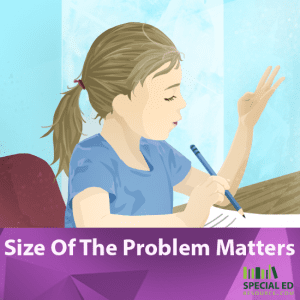 The size of a problem truly has to do with perception and is different for every child! Certain situations like a papercut, for example, can be the end of the world for a 3-year-old, where as it is almost meaningless for an adult. Tons of special education resources exist to help parents understand HOW to tell what type of events fit into different problem sized categories specific for their child.